Now the sun is starting to appear again I have been shopping for a new wardrobe so I’ve put together an outfit of my favourite pieces I’ve seen online. I love this stripe bodycon dress! The length is perfect, especially for someone my height, longer dresses usually swamp me! The material isn’t too clingy which makes it light enough for the warmer weather but wearable throughout all seasons. Sleeveless jackets and duster coats have become more fashionable over the past couple of months. You can get them in every colour, length and size which means you can team them with a lot of outfits. I love this white jacket paired with the stripe dress. It instantly makes it look incredibly fashionable and dressy; for lunch with friends or drink at a chic bar! I also think the jackets look really smart with work wear, giving you the fashionable edge over your colleagues! I love wearing cotton style scarves, they instantly brighten up any outfit, and that’s exactly what this gorgeous lime green does. Draped next to the white jacket the scarf gives a beautiful pop of colour appropriate for spring. I love to wear these type of scarves loose, not wrapped around the neck because I feel like this elongates the body, which is never a bad thing! Powder have an amazing variety of scarves in all shapes and textures and another of their range I love is the Lillian….go and check it out! I am in love with these wedges! I think the colour is absolutely beautiful, the pastel green is so on trend. 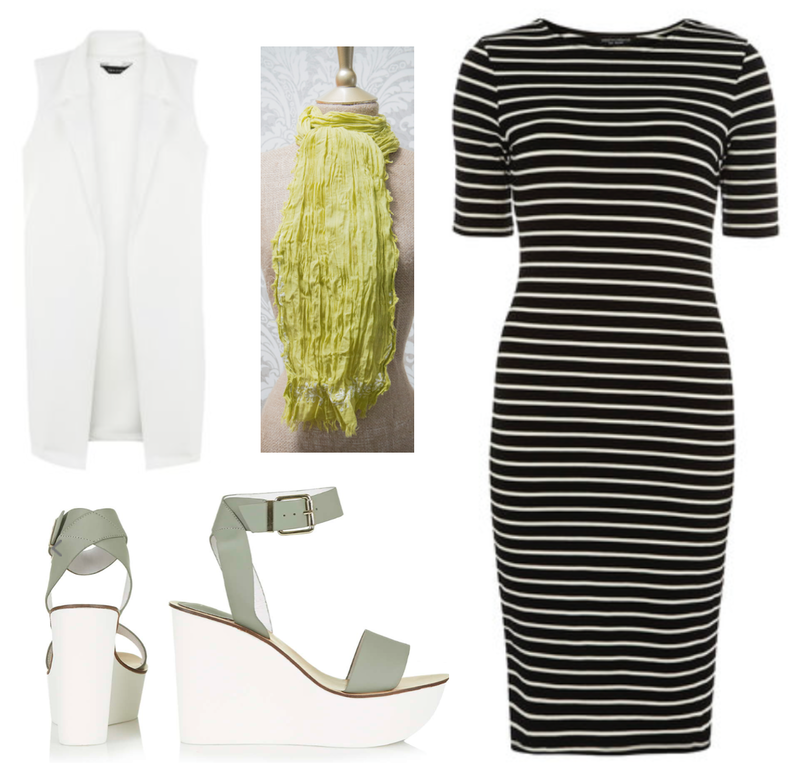 They give a second pop of colour and the wedge makes your legs look longer. They can look dressed down with a casual dress or jeans, or dressed up for a night out on the town!